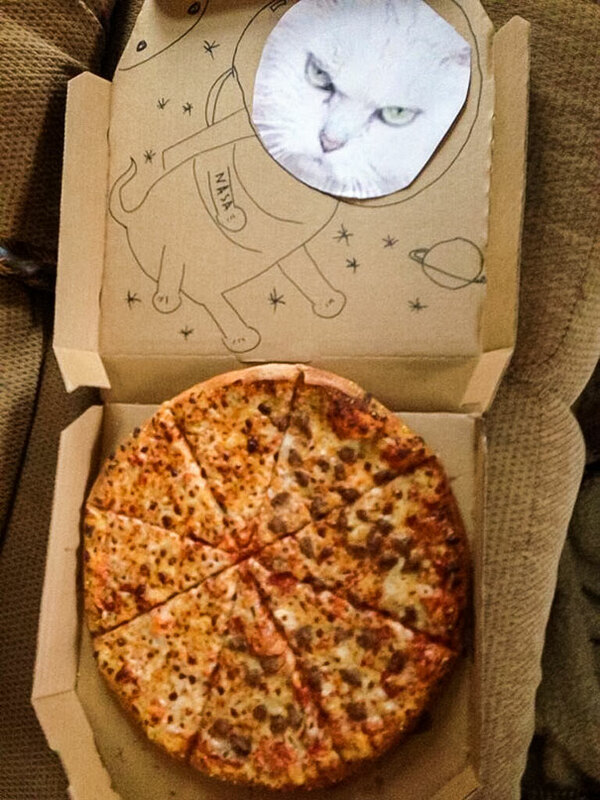 For MONTHS this guy asked the pizza place to draw a cat inside his pizza box. Then, one fateful day, he FINALLY got what he asked for. It was definitely worth the wait, this drawing is awesome! Well, this person got what they asked for! 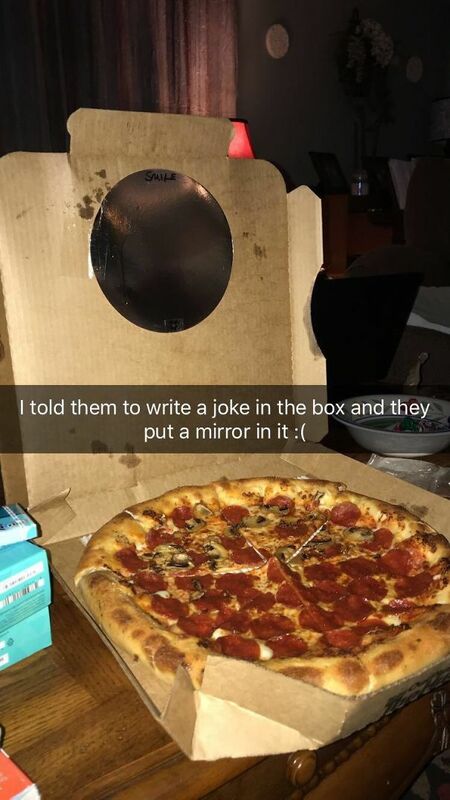 As if the mirror wasn’t bad enough, it was the fact that they wrote ‘smile’ on it as well. It really does make you rethink your life choices and whether you should order pizza ever again once you’ve been SHAMED. This guy really got what he asked for. 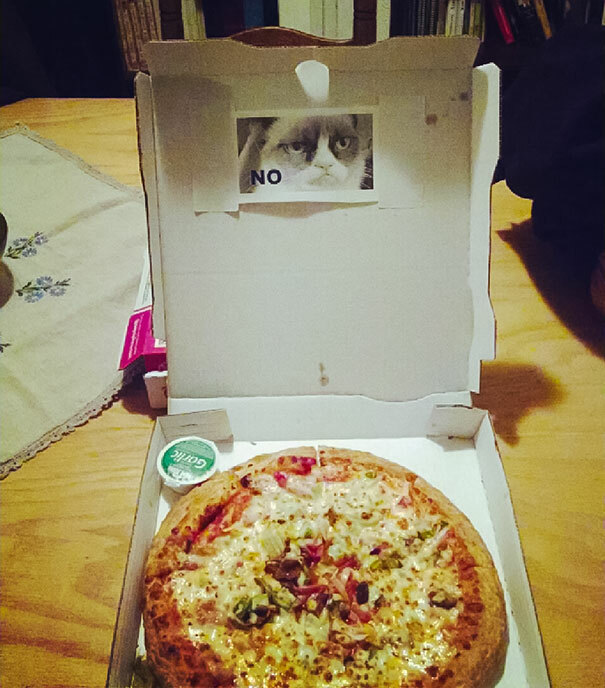 I have no idea if they actually sent him the pizza he ordered as well or…I really hope they didn’t and they just responded with this. Teaches you to stop being a creep! 5.) 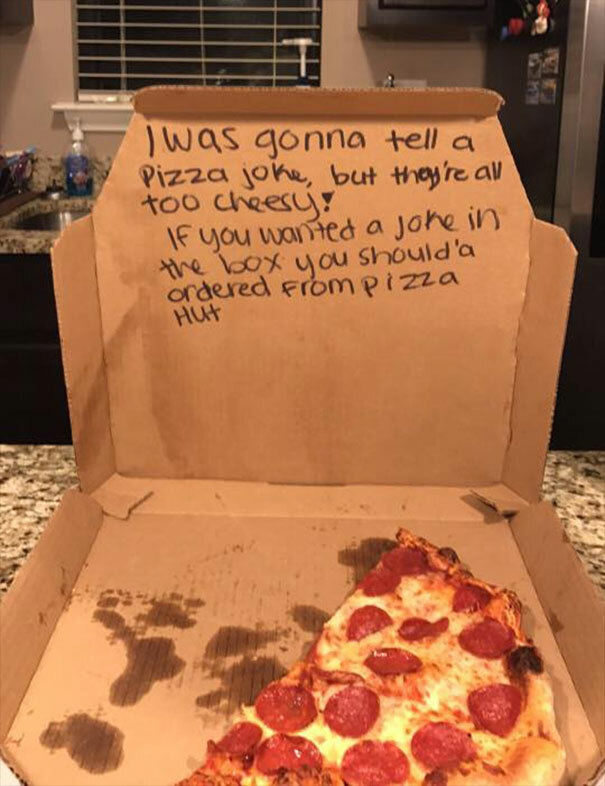 They finally wrote a joke on the box! 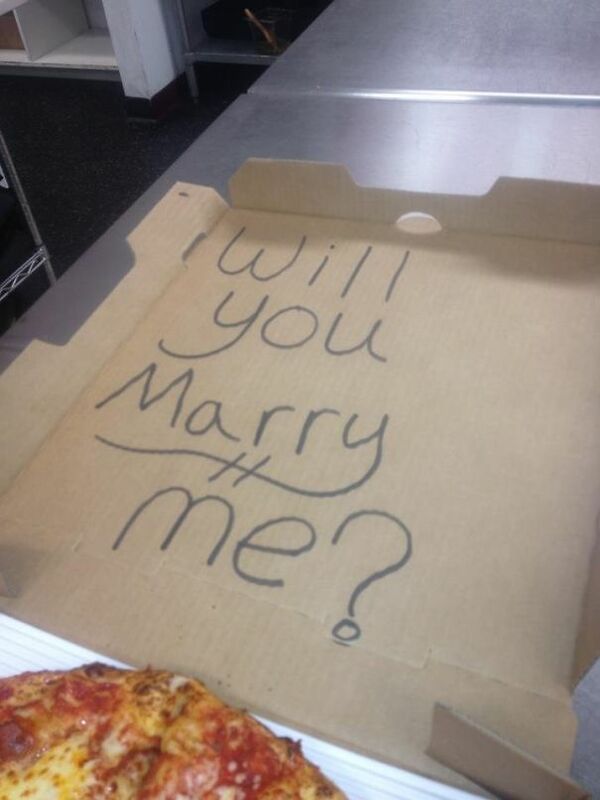 Aww, this is the cutest pizza box I have EVER seen its just adorable. I feel really sorry for the happy dinosaur that can’t show it by clapping his hands, how heartbreaking! 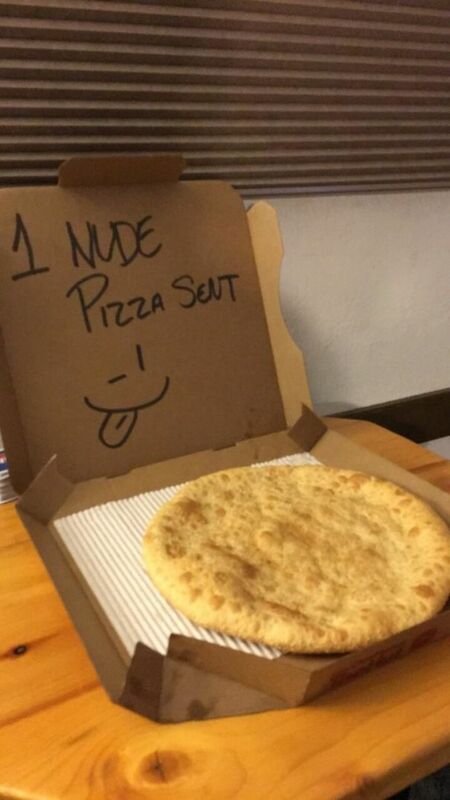 I hope the recipient of this pizza box tipped. One, his girlfriend says yes but the boyfriend doesn’t want to and it’s intensely awkward. Two, the girlfriend says no and doesn’t believe the boyfriend when he says it wasn’t his idea. Three, the girlfriend says yes, the boyfriend wanted to marry her anyway, they live happily ever after as the walk hand in hand towards the sunset. I bet this guy was happy when he received this joke upon request. Although a little savage, I must admit that this joke is pretty funny. I hope that lady had a burn kit on standby. This one really did make me chuckle. Hipsters have obviously done EVERYTHING before it was cool, the rest of us are just losers, clearly. I wouldn’t exactly say that this looks like a ‘cute heart’ but it’s a pretty realistic one instead! 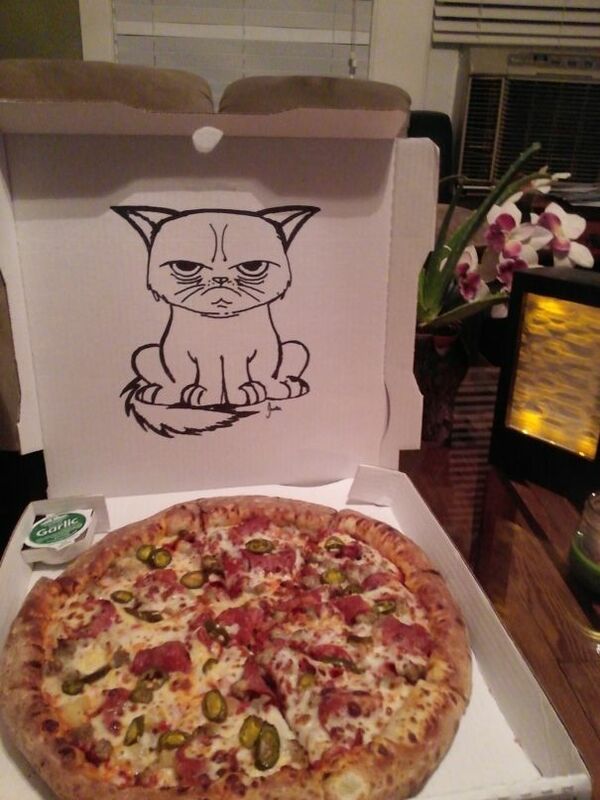 This really is an impressive drawing and this pizza guy definitely deserves a tip! 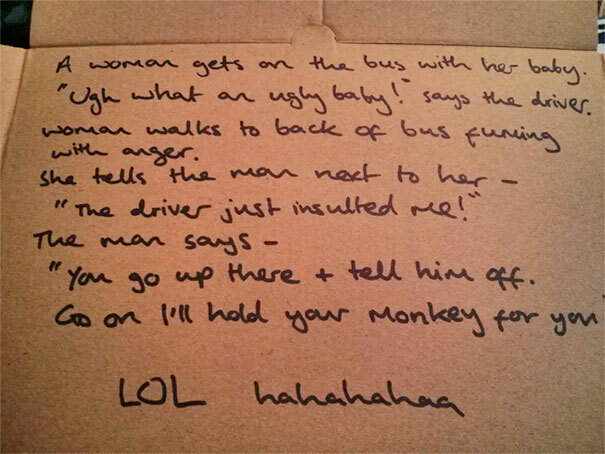 I love this one because they refused to write something funny and so ended up being funny anyway! Who doesn’t love a good grumpy cat meme? Now, that really is the classiest cat I have ever seen. I kind of love that cat so much I want to frame it so it can stare at me and judge me as I eat last night’s takeaway cold and at 11 am. 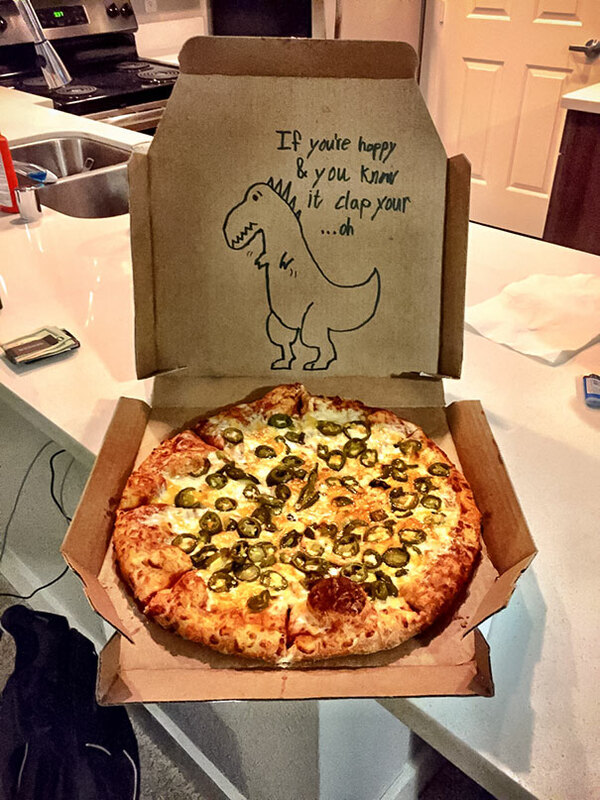 They asked for a drawing on their pizza box and this is what they got. Hey, at least it’s SOMETHING. I’ll go to Starbucks to ask for my drawings now instead. 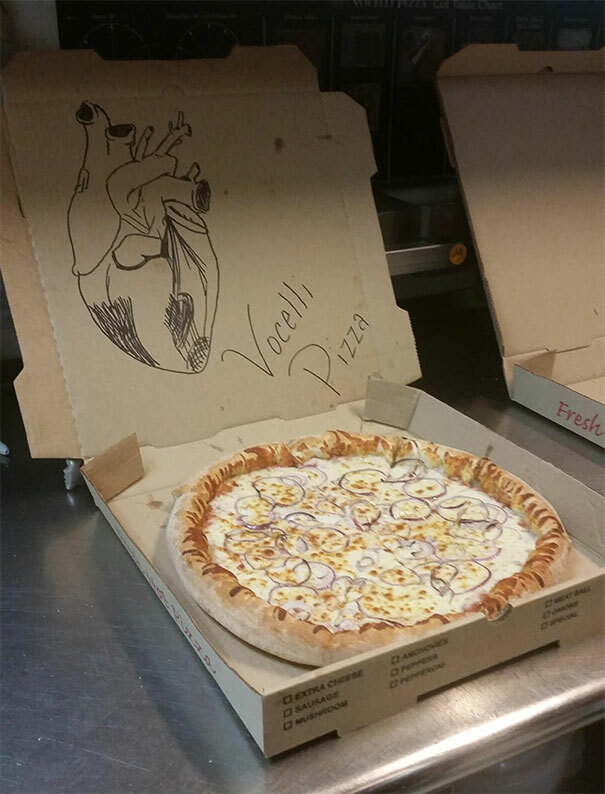 This pizza worker certainly delivered on the brief, quite literally. 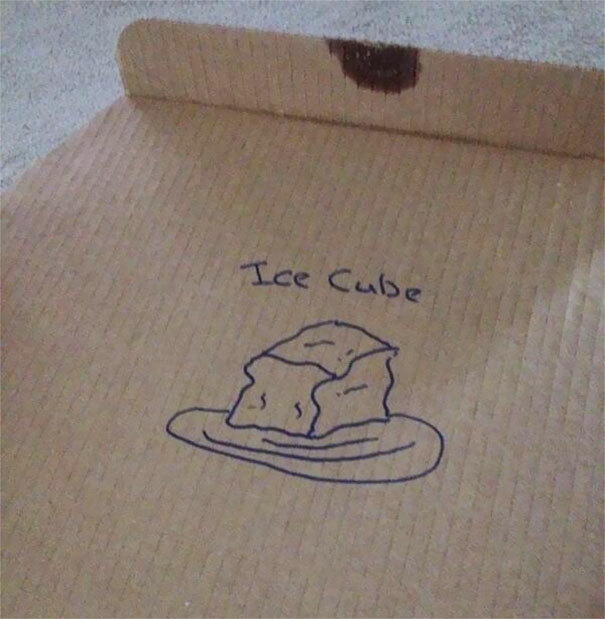 They really do have a great sense of humour and that is quite an impressive ice cube drawing, might I add. Now, this is hilarious. Top marks for dry humour, however, they asked for a PICTURE so this gets a solid 8/10. 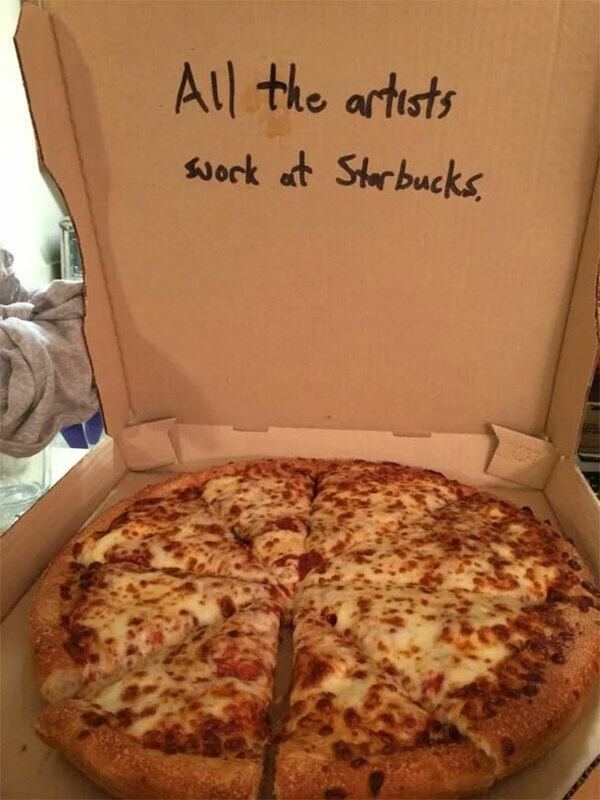 Odd request but okay…these pizza workers smashed it! 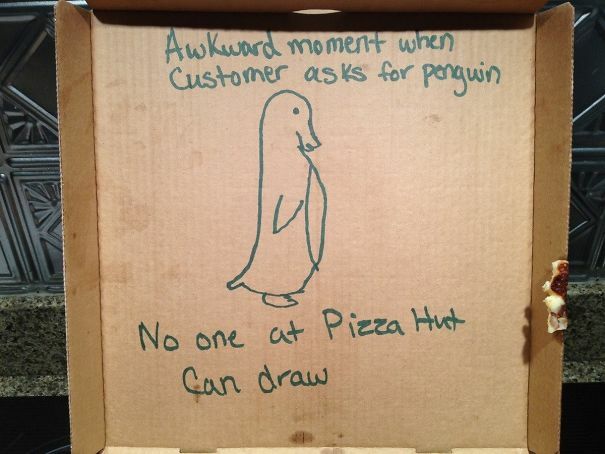 Although they lied about their artistic abilities, that’s a far better penguin than I could ever draw. Now, this is slightly disturbing, you really do get what you ask for. However, that HORRIFYING Spongebob is something that I will never be able to unsee. Top marks for disturbing your customers! Now, this really is something special. The time and effort that went into this magical space cat is just astounding! 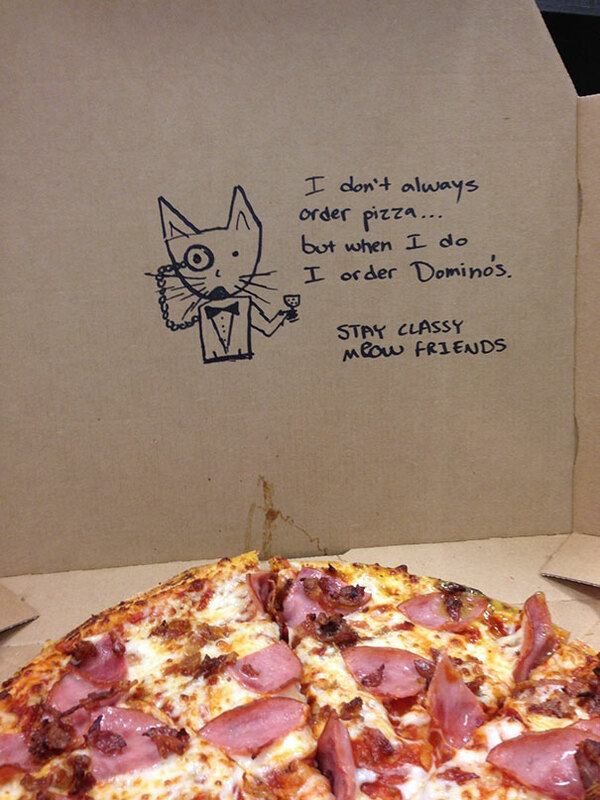 Maybe they should have spent more time cutting the pizza properly though because THAT is tragic. Wow. Now, that really is annoying. I’m not surprised that they got such an angry and frustrated meme back. 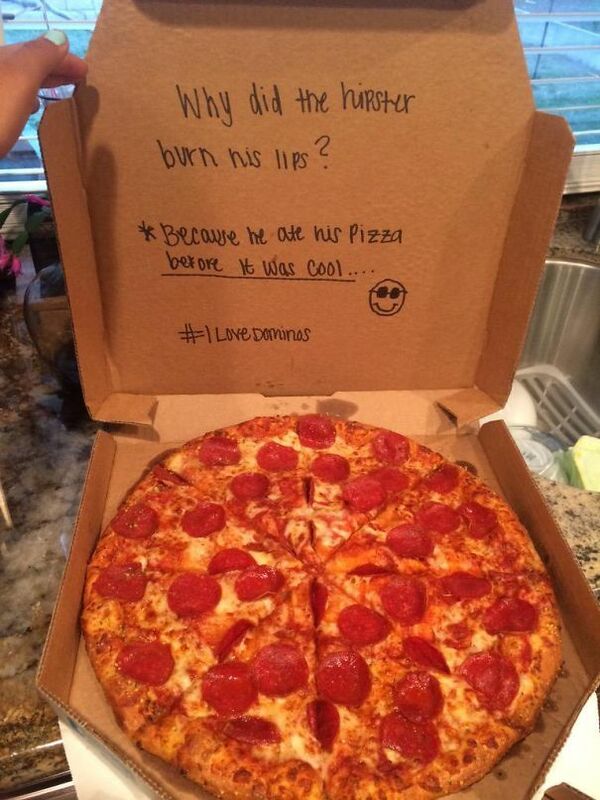 At least they didn’t sabotage the pizza in retaliation, it looks delicious. Aw, okay this is really sad. 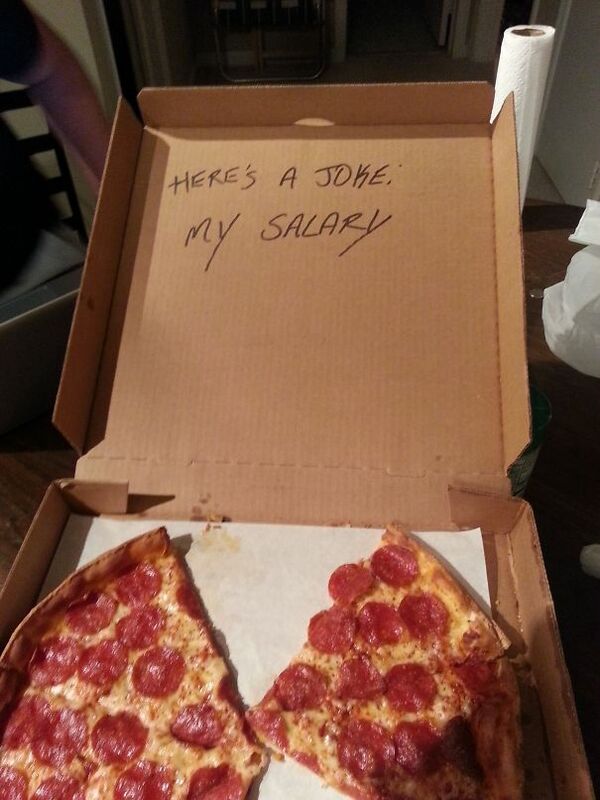 It’s true that pizza workers don’t get paid enough for the long hours and busy work. 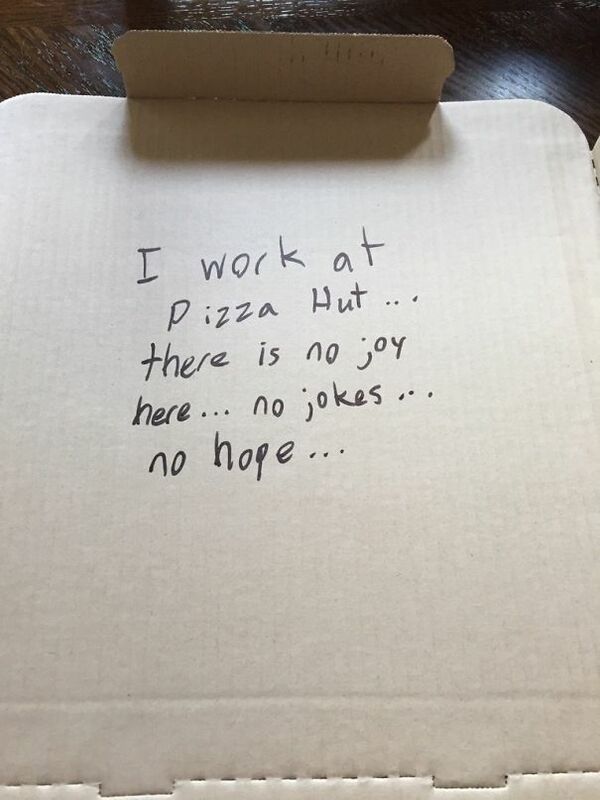 This is why you should DEFINITELY tip them for bringing you pizza, I mean, they are basically heroes. 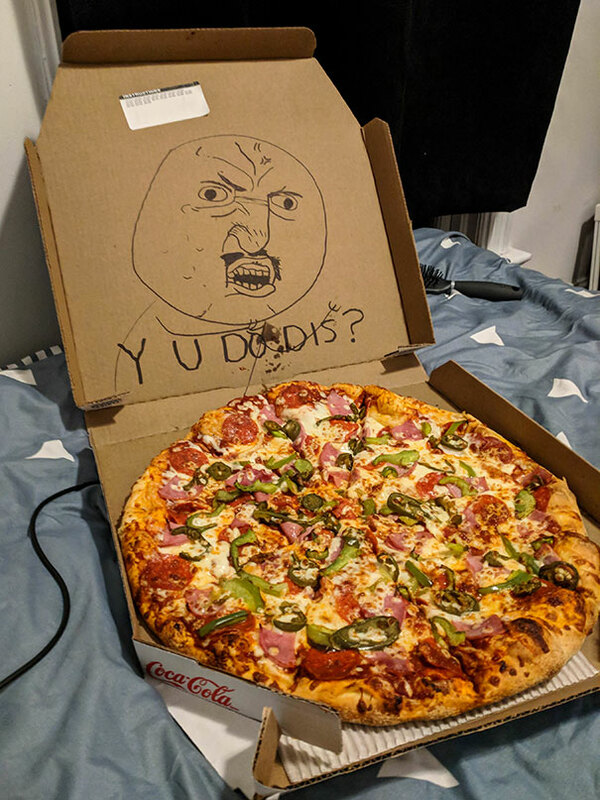 I bet that the next time you order a pizza, you are definitely going to write something in the special instructions now, aren’t you? I might even write something a little bit more adventurous than ‘drive safely’. 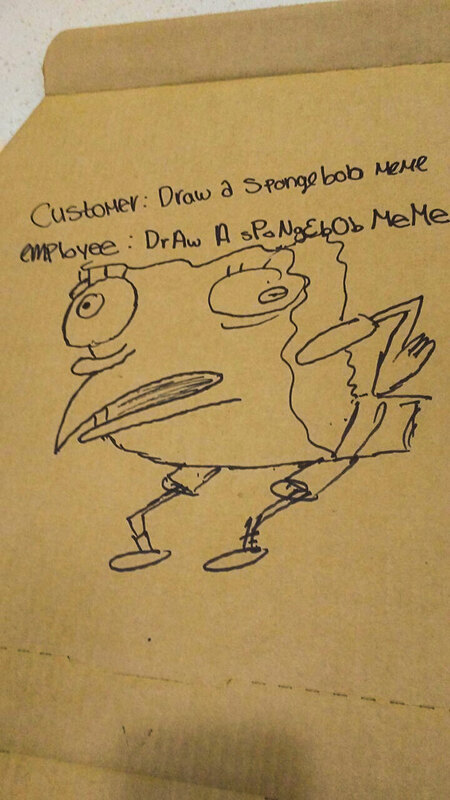 Have you ever requested a special drawing or joke? Let us know in the comments!